The face undergoes a vast array of changes as we age: increased laxity of tissue, loss of fullness, descent of facial structures. Many patients present with an initial complaint of “droopy” eyelids. Patients and physicians alike use the phrase “droopy lids” to describe a myriad of conditions. True “droopy” eyelids, or ptosis, occur when attachments between the eyelid elevating muscle and the structure of the lid weaken and stretch, causing the eyelid itself to descend over part or the entire pupil, obscuring the patient’s vision (Fig. 1). Surgery can be performed to tighten these attachments and return the eyelid to its normal height. “Droopy” eyelids may also refer to increased laxity and redundancy of the eyelid skin, which then hangs over the eyelid and obscures the lid, the lashes, and possibly the pupil. This condition is known as dermatochalasis (Fig 2). If there is enough redundant skin to cause visual obstruction, this excess skin can be surgically removed with a procedure known as a blepharoplasty. These changes in the aging eyelids may occur in isolation, or they may be related to corresponding changes in the forehead and brows. Aging and gravity can cause relaxation of the forehead and subsequent descent of the eyebrows. This allows the thicker brow tissue to lie over the thinner, finer eyelids. The resulting brow ptosis may worsen the appearance or severity of a patient’s “droopy” lids. When this occurs, removing eyelid skin alone may not fully correct the problem and can leave the patient with the continued appearance of redundant eyelid skin or a persistent visual field defect. In these cases, the eyebrows must be addressed and restored to their natural position. Several methods exist for correcting brow descent, each of which has distinct benefits and limitations. It is important for patients to delineate their aesthetic and surgical goals, and for the surgeon to explain the surgical techniques available to address these goals as well as what can realistically be achieved with each procedure. Some of these procedures include the removal of tissue from immediately above the brow, from the mid forehead, or from behind the hairline, thereby lifting the brow. A newer technique for brow elevation has evolved over the past decade that involves minimal to no tissue removal. Known as an endoscopic brow lift, this technique elevates the brow through small incisions placed behind the hairline. A scope is inserted through these small incisions for visualization, and dissection is performed using specially designed instruments. Once the brow and forehead are adequately loosened, the tissue is elevated and held in position using absorbable sutures or fixation devices. The brow heals in this higher position over the next several weeks, and the small incision sites virtually disappear behind the hairline. Benefits of the endoscopic technique are the smaller scars hidden in the hairline, the selective brow elevation without the need for removal of any hair or skin, the excellent control of both the glabellar region and temporal brow, and the rapid recovery time. Figure 3 show a patient who underwent an endoscopic brow lift. The improvement in appearance of her upper eyelids is due to elevation of the brows alone. No tissue was removed from her lids. 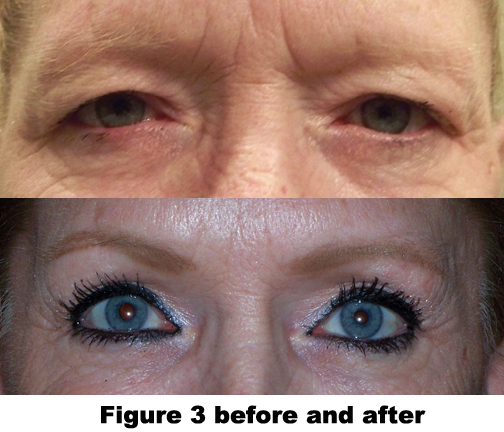 Patients who complain of “drooping eyelids” may be a candidate for blepharoplasty or brow lifting and can have their vision and appearance improved by these procedures. A thorough evaluation by an oculofacial plastic surgeon can determine the underlying cause of a patient’s complaints and address them in a way that will leave the patient seeing and looking better than they have in years. If you think you may be a candidate for these procedures or would like more information, please contact Dr. Bryan Seiff or Dr. Ari Abel at the Abel Center for Oculofacial Plastic Surgery. If you think you may be a candidate for these procedures or would like more information, please contact Dr. Bryan Seiff or Dr. Ari Abel at the Abel Center for Oculofacial Plastic Surgery at 302-998-3220. ← Previous Story Why Choose Chiropractic Care For Families And Children?